I am delighted to bring you the PaperWorksCo Papercardkit for the month of September! Peggy has on offer the gorgeous Authentique's Journey Collection ... and let me tell you the paper in this kit is nothing short of stunning! 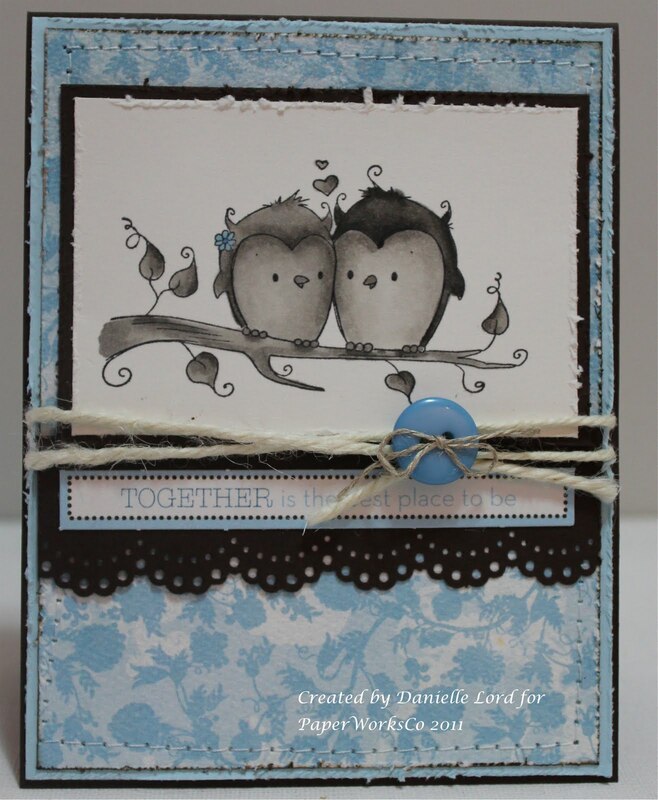 So to show off my first project I went with a shabby chic look and coloured up RAM's 'Whoo Loves You' stamp. I used my copies and kept to the tones of Toner Greys for a monotone look. I just coloured in the girly owl's flower blue for a little pop of colour. I distressed the edges with my distressing tool, inked up the edges and got out the sewing machine. The sentiment is one of the bonus cutouts that come with the kit. I used the MS doily border punch and finished up with some embellishments from the kit. Here's a slightly different angle to show you the design of the card. Peggy's papercardkits are amazing value for money at only $11.99 - enough card stock and papers to make a dozen cards! Thanks for stopping in today - we're enjoying a Bank Holiday Monday today here in Canada - the last day of summer holidays before the kids head back to school tomorrow! I've absolutely loved this summer and am sad to see it end but it IS time for the kids to go back to school ... LOL!! Enjoy your Monday and hope it's a wonderful start to the week for you! Thank you for any comments you leave - I appreciate every single one of them! Danielle, this card is gourgeous! Love the colors, the image, sentiment, well, OK, I love everything! Thanks for joining us at Paper creations Ink. did you want to join in my candy?? Lovely work Danielle, such a sweet image. This is a gorgeous card. I love the super cute image and the fabulous layout. WOW GORGEOUS,such a sweet images and the papers are beautiful!!! Thanks so much for your lovely comment!! 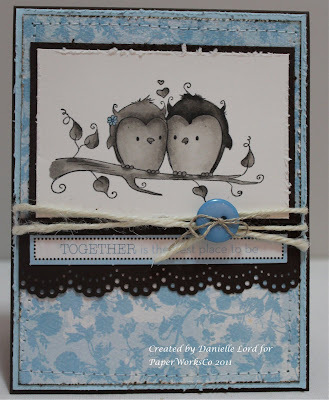 Thank you for playing in the Blue & Brown Challenge at The Crafty Pad this week! Oh I love your gorgeous card, what a sweet image. The greys are so perfect with that shade of blue paper! The button and the twine...oh so nice! Love how you coloured her little flower in the blue and kept it all soft greys! I too had a fantastic summer and hate to see it end! At least my blog will be tended too! Wow this is cool. Love the Grey colored image and it's so perfect on the blue papers. Totally cute. Thank You for joining us at Paper Creations Ink! Lovely vintage card! Love the image and the coloring is fantastic! Thanks for sharing it with us at Paper Creations Ink and come back soon! Aww this is such a beautiful card Danielle! I love your colouring!